this little stretch of spring like weather. It's good for the soul after the harsh winter. What I've got to do next is run down to the farm supply and get some old used wood pallets. 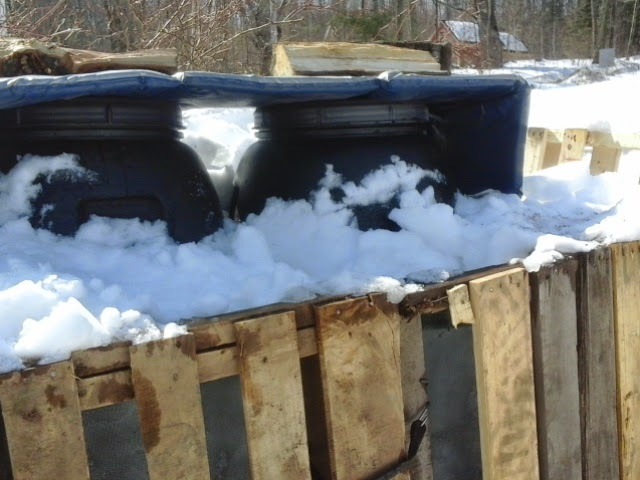 Our sap storage tanks are big 55 gallon plastic barrels (drums, really) that are sitting out in the snow to keep the sap cold. With these warmer temps, snow levels are dropping and I need a way to pack snow around these barrels as high as possible. So I'm going to go get some pallets and wire them into a sort of cage around the drums so I can pack them with snow and keep that sap cold! Sap is like milk, it will spoil fast if not refrigerated. So, I am back from the farm supply. Here is what I made. I just bungeed some pallets together and packed snow all around inside as high as I could. This should keep the sap plenty cool. I also put a cover over the top of the barrels, since they are black and absorb solar warmth. It's just an old camping pad, but it's silver on one side and reflective, so I figured it would not only shade the top of the barrels, but also reflect back some heat to keep them cooler. Weather: It is ALMOST 50 DEGREES OUT THERE!!! WOOHOO!!!! Love the chickies! I am going to be really jealous when you have fresh eggs coming in.